Himalaya Natural Fibre Foundation (HNFF) was founded and registered in 2006 by a group of local indigenous people of Sankhuwasabha and Solukhumbu districts of Eastern Nepal. It is a local and non-profit organization registered in Kathmandu and affiliated with Social Welfare Council. HNFF was established on the basis of the economic and social benefits of allo, the Himalayan giant nettle. HNFF works in remote districts of Nepal where natural fibres are available and being used by indigenous and marginalized community people for subsistence income..
Economic self-reliance and prosperous society of indigenous, disadvantaged and marginalized people of rural Nepal. 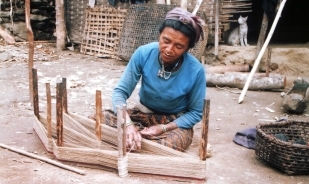 The mission of HNFF is to make Nepal one of the major high quality natural fibre products suppliers, so that indigenous, disadvantaged and marginalized people from remote fibre-producing districts can benefit economically, culturally and environmentally. HNFF strives to achieve the highest standards of governance, accountability to stakeholders, representation of the natural fibre sector, and services to fibre-producing communities in the Himalayan region. To empower indigenous groups, marginalized communities and other vulnerable groups involved with natural fibres to advocate for improved policies and services so that economic and social benefits flow to the producers are ensured. Copyright©2011-2013 HNFF. All rights reserved.